Senator is better known for its range of pontoon boats. Does the more conventional Typhoon range meet the same high standards? The eye-catching bronze Senator Typhoon is finished in vinyl graphics, which is tougher and considerably cheaper than conventional paintwork. It creates an impenetrable water barrier, protecting the underlying hull and cabin, and has a lifetime of up to 10 years. At the end of its life it is easily removed, exposing the as-new surface underneath, ready for a new colour treatment. The forward cabin has two full-length bunks with storage space underneath the squabs. An infill turns the area into a large double bunk. The forward section of the bunks lifts up to reveal a plumbed toilet. The sides and roof of the forward cabin and helm area are carpeted, giving it a quiet and warm feel. The sliding (and lockable) door to the cabin gives privacy and ensures the weather will not get in. The helm area has a unique layout, with the hydraulic steering mounted onto a protruding pod, creating a carpet-lined shelf behind it. A raised edge makes this ideal for securely holding cell phones, keys, cameras and the like. 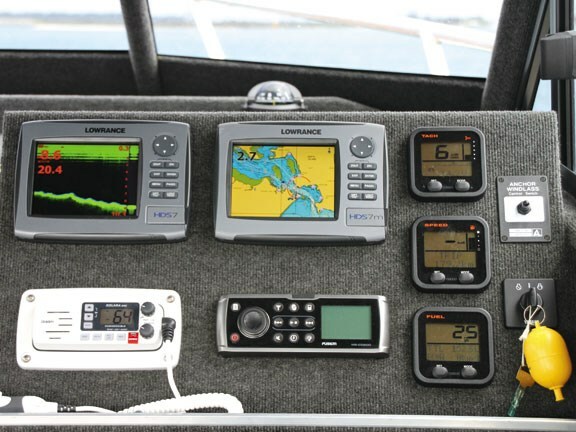 The main helm is dominated by twin Lowrance HDS 7 displays, one with a chartplotter display and the other the fishfinder. 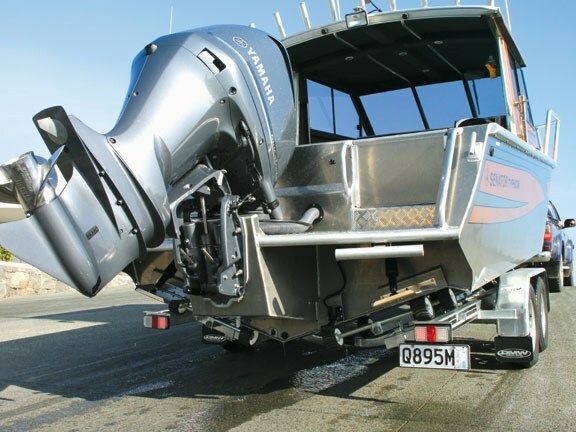 A trio of Yamaha digital engine gauges allow all the important features of the engine to be seen simultaneously, while a Uniden VHF and Fusion stereo system complete the electronics. 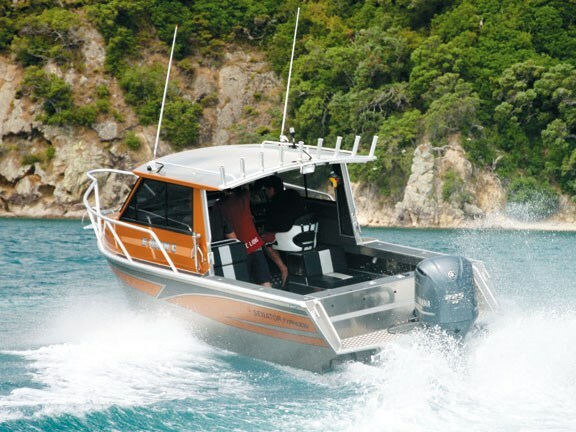 This certainly is a boat designed for rough conditions, with a proliferation of grab handles over the whole boat. 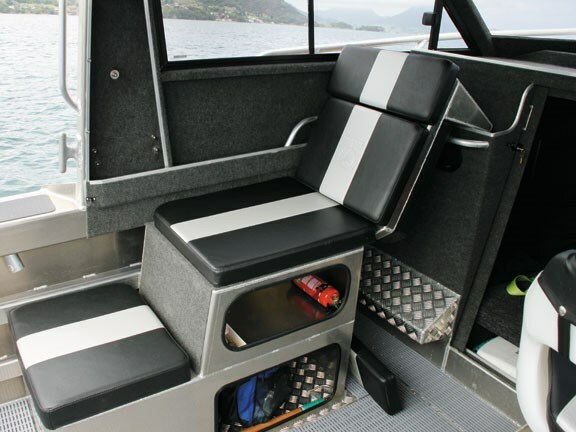 The skipper’s seat is a swivelling plastic model fitted to a welded alloy pod, while the passenger has a high padded seat that lifts up to reveal under-seat storage. A flush-mounting cooker and sink unit can be fitted into this space. The passenger seat can also reverse and fold out to form a rear-facing recliner. Starting up the ultra-quiet Yamaha, we headed out of the marina. A new cushioned propeller bush meant that we did not even feel or hear the usual "clunk" as the engine is put into gear. Opening up the throttle and the boat hauled itself onto the plane effortlessly. The unique sleeveless cylinders in the new Yamaha motor allow for a larger bore than previous models, giving exceptional acceleration. The fuel economy was excellent, with better than 1.3km/L coming up on the gauges when we were at 20 knots. The cockpit is set up for fishing, with wide gunwales and nine rod holders. 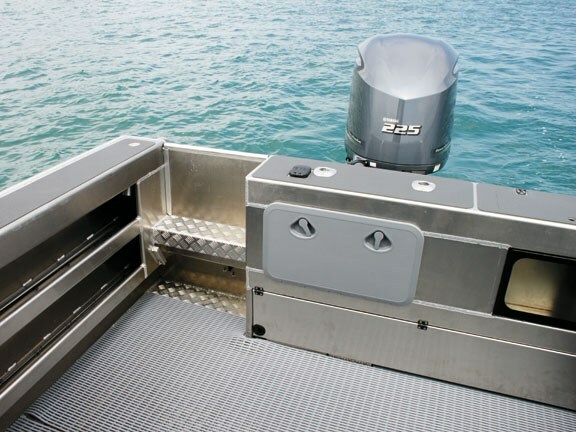 Tube matting provides secure footing, and a pair of under-floor wet lockers provides storage for the catch and any gear. 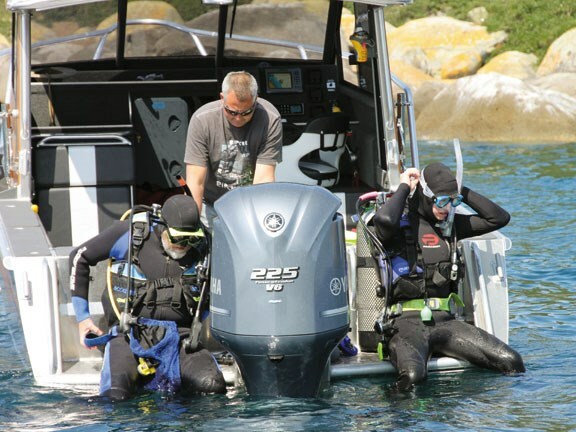 The port side of the transom features a plumbed live-bait tank with viewing window, while the starboard side has the step-through (with drop-in hatch) onto the huge Portofino-style boarding platform. Finding some rough water in a channel, we were able to test the boat’s handling, which was superb. 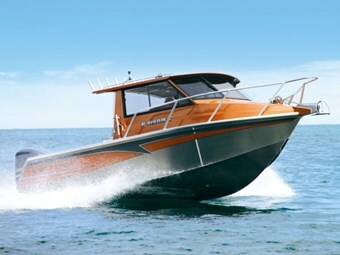 The strakeless hull gives a smooth and quiet ride, while the wide chines turn the spray away from the boat. The big chines also help when turning, creating a tight, controlled turn that is entirely predictable. 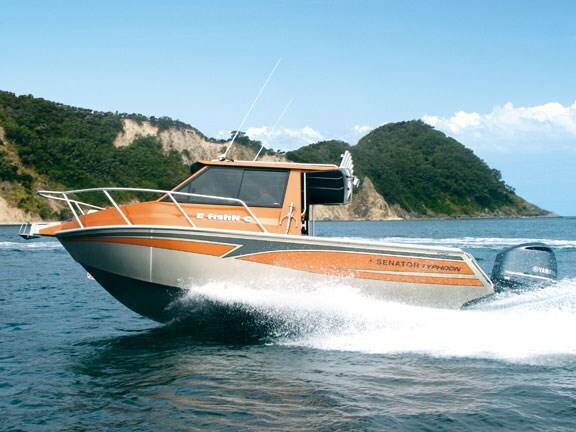 The Yamaha provides a good top speed, well in excess of 33 knots (60km/h) although we were not able open the throttle fully. Even at the higher speeds the fuel consumption from the V6 remained pretty good, rarely dipping below one kilometre per litre. The conditions were a bit too flat to consistently get the boat airborne, but when we did the landings were smooth and quiet. The large cockpit made kitting up easy, and stepping out onto the huge boarding platform was a revelation. The Senator is wide enough to walk, with kit on, behind the motor. Upon our return the bilge pump quickly got rid of any water we spilled, and back at the marina the boat was easy to get back onto its DMW tandem-axle trailer braked trailer. Built to the same exacting standards as its pontoon boats, the Typhoon appears to lose none of the interior space, rigidity and safety that Senator is renowned for. See the Senator Typhoon for sale.